Are you looking for the cure that will help you conduct a better business-to-business (B2B) marketing campaign? Market your pharmaceuticals more efficiently after downloading this accurate, human-verified pharmacy list. Find direct contact information, including pharmacist and pharmacy email addresses, pharmacy phone numbers, mailing addresses, and more. 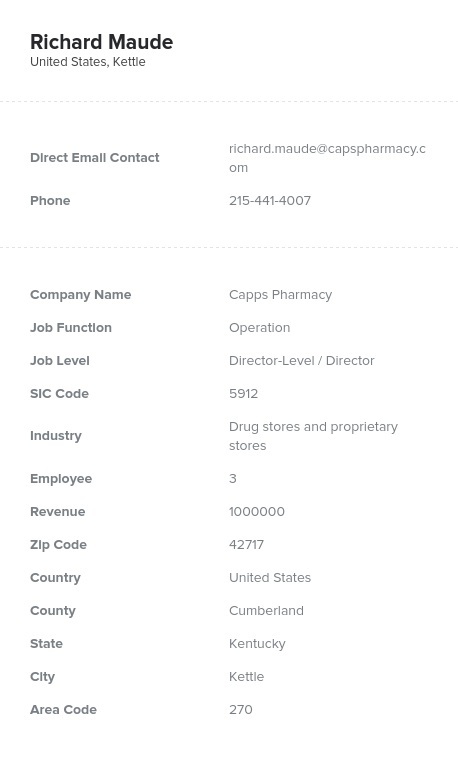 Marketing to pharmacies is easier than ever with the help of Bookyourdata.com! Our accurate pharmacy email list contains all of the full, direct contact data that you need at an affordable price. These highly sought-after contacts are included in this premium pre-built directory, which is ready for you to download, integrate into your CRM, and use right away. Whether you're marketing a vitamin brand, over-the-counter medication, pain or cold medicine, organizational software program, customer database, or some other relevant product or service, this pharmacist email database is absolutely vital for your campaign. Pharmacies market to and serve a wide array of communities and patients. Their influence is far-reaching, as it's where many people visit to find over-the-counter and prescribed medicines for a variety of common illnesses. To market to a highly qualified pharmacist, email lists like ours are the remedy your business needs. Make sure your health-oriented product or service gets the recognition it deserves from the people who are most likely to recommend it with these verified pharmacy email addresses. Buy our targeted contact list of pharmacies and make sure that the decision-makers within the world of health and healing know about your brand, products, services, and company. Reach out to these sales leads and you'll be likely to boost recognition, extend your reach to new communities, and — hopefully — increase sales overall. Mail, call, or email leads using our huge, downloadable pharmacy mailing list today.